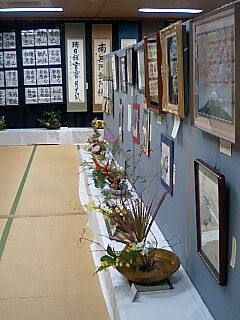 Here's the room with the art, calligraphy, and flower arrangment displays. It was actually surprising to me how many students take extra curricular calligraphy classes. It's nice to see the young ones taking an active interest in such a traditional art. Man, I have a goofy smile in that photo. My teacher was taking it with my cell phone camera, and the kids behind her were teasing her & making funny faces because my teacher was squinting so much to take the photo. These kids were later climbing all over me (I made the mistake of letting one climb up on my back so she could see the performance on stage) and playing with my hair, and asking me a million questions. Hilarious. Elementary school kids are the same everywhere I guess. One recent Saturday I had to work, so I had the previous Thursday off. 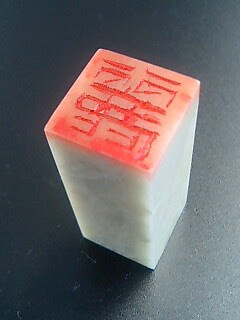 My painting teacher had sent me to Nagasaki to buy a stone and carving tool so I can make another inkan (seal to sign my paintings), but it was an exercise in futility. 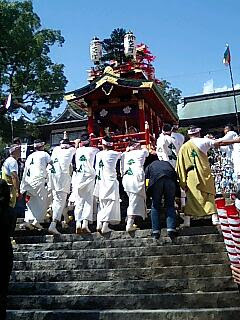 However, the trip wasn't a complete bust, as I was able to attend part of a festival called "Okunchi" in/around/for (?) Suwa Shrine in Nagasaki. It's held every year October 7-9, and since they don't change it to make sure it falls on a weekend, many people have to work and therefore miss out. 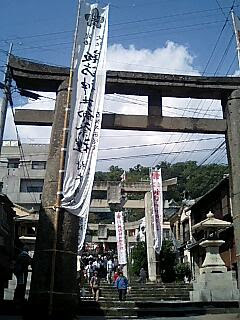 Here are the torii (archway/gate/s) leading up to Suwa Shrine, where this dance took place. I think there were 2 other locations around the city where representatives from a select 7 machi (towns or sections inside the city). Here they are pushing it up the stairs to the very small! stage area in front of the temple. Here is a look at the crowd in the stands watching the performance. 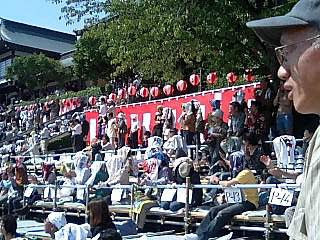 If you look closely, you can see many people have a cloth over their head to keep the sun off of them...it's still pretty hot in Nagasaki! 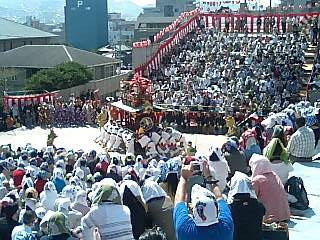 Feel free to comment if you've got any experience with the Okunchi festival! Well...I'm definitely not bored lately! 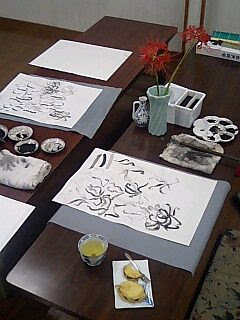 I've been helping my students practice their speeches (never ending task) and now I'll be heading to my Japanese ink painting class. 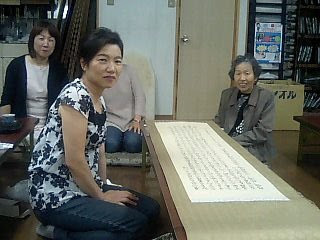 Here is my teacher's mom (the one who always makes and gives me tasty food) showing one of her calligraphy scrolls to some ladies from the neighborhood. Hope you are all well and enjoying Fall's cooler temps and harvest! Just thought I'd put up a quick pic since you all have probably forgotten what I look like. Thanks, Skii for the dress! I felt like a million bucks! 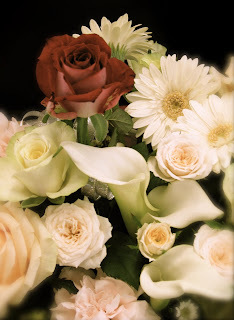 And thank you, B, for the flowers - they're really lovely! Here's my first "art" inkan (personal seal ~ my 'signature'). I have another one (that's registered in Japan) that has my full last name on it in katakana, and I have to use it when I "sign" for important things. 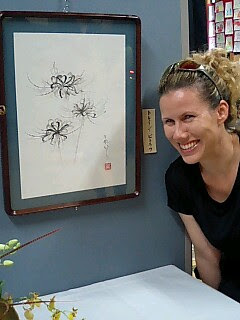 This inkan, however, only includes part of my first name, "rei" (which is really To-RAY-shi in Japanese). 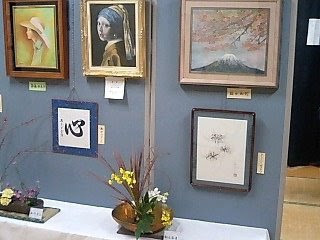 This kanji for rei has to do with beauty. So, since I think beauty is such an important ideal, I thought this would be fitting. Funny how when the sun comes out everything can magically feel a little better. This week in my painting class I actually painted from a live subject. I usually paint from a book (twisting every step of the way...but I'm not the teacher...), however, this week my teacher let me paint some higanbana, a flower that's blooming now (& the one in the previous post). I'm going to need more practice with this subject, but I thought you might like to see my first attempt. The red thing is my inkan (name seal). I'll photograph that and explain it a little better in another post. Here's a photo I took of my workspace at my teacher's house. It's a really interesting place. From what I understand, my teacher lives with his parents in one (Japanese style) house, the grandparents are in a separate one on the same property, and then they have this painting building. It looks like they might have a garden on the property, too. In my workspace you can see my practice paper on a piece of grey felt, my ink well, water (brush rinse), the porcelain container that holds water to add to the ink to get various shades of grey-black, fude (brush - it almost sounds like "who-day"), blotting towel, my subject, higanbana, and, of course, some delicious tea and treats (this week it was homemade veggie tempura) from my teacher's mom.